The dynamic president of JAG Physical Therapy, John Gallucci, Jr., MS, ATC, PT, DPT, is in demand for his expertise in injury prevention, rehabilitation, sports medicine and athletic conditioning. He has appeared often on radio and television, including ESPN’s award-winning “Outside the Lines”, Fox 5, PIX 11, MSG Varsity, NJ News 12, WFAN and is a popular public speaker. Most athletes and exercise enthusiasts are well aware of the importance of a proper warm-up prior to physical activity. 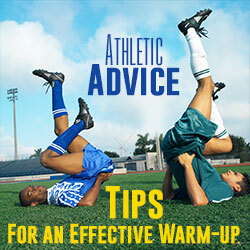 A warm-up helps improve performance and decrease the risk of injury. However, the question becomes: how do we know if we are warming up correctly and effectively? Studies show that a prolonged stretch just prior to a competition can actually lead to decreased performance. Active movements (such as light jogging) increase blood flow and improve the ability of the muscle to contract and relax. Prolonged stretches are an important tool for the improvement of flexibility but should be done after a competition. In the case of soccer, this means simple passing and movement drills before going into the game. Doing this targets and prepares the specific muscles needed for the activity. An effective warm up is integral to improving performance and reducing the risk of injury for athletes and exercise enthusiasts at all levels. No matter the activity, devoting a few moments to a warm-up before setting out can prevent months of rehab due to an injury. A good rule of thumb is that the athlete should be sweating prior to engaging in more dynamic athletic activity. Depending on the athlete’s sport and position, different musculature is used more often than others. If you look at the end-lines of any Major League Soccer game, you will see a group of players continually moving through a circuit of light jogging and agility drills designed to keep their legs warm and ready for action. These athletes know their bodies well enough to understand that they cannot just jump into the game directly from the bench. Staying loose and flexible will keep them ready to go at a moment’s notice and, most importantly, will keep them safe from injury. When talking about a warm-up routine and getting ready for a game, hydration becomes an important factor and something that coaches and athletes should focus on. Just as it’s important for youth athletes to learn their sport’s drills and skills, it’s crucial for them to have knowledge of how the body works and how to take care of it. Water should be readily available during all athletic activity and water breaks should be programmed in to all practice schedules, especially if the environment is high-risk. Coaches, parents, and athletic trainers should encourage their athletes to pre-hydrate prior to activity. This process begins about 72 hours in advance of competition, but hydration should be thought of as a good maintenance practice to include in the daily routine. The FDA recommends drinking six to eight, eight-ounce glasses of water per day for a normal healthy lifestyle. This recommendation is universal, and is a good practice to keep the body in peak physical condition. During activity, athletes should rehydrate with six ounces of fluid every 15 minutes. Sports drinks are fine, but keep in mind that most sports drinks contain large amounts of sugar that are not necessary to the hydration process. In a very hot or humid setting, too much sports drink can cause nausea, bloating and diarrhea. Water is usually sufficient for hydration. Spending too much energy during the warm up can lead to fatigue, which can result in decreased performance and greater chance of injury. This becomes particularly evident in baseball and softball when a player throws too much or too hard prior to going into the game. Remember to keep all warm ups simple and light.